It looks like John Gruber of Daring Fireball was right on the money, expecting only software enhancements to both iOS (8) and MacOS OS/X (10.10 aka Yosemite), plus some associated development tools. Most blogs out there are picking things through in detail, hence i’ll try to go the other way – and start with changes apparent to the user, and work back from there. The first thing is that there is an “in the event of an emergency” card you (or anyone else!) can call up from the lock screen. Not only to contain key medical data in the event of an emergency, but also associated contact details – so if you lose your iPhone or iPad, there is a fair chance of a good samaritan being able to return it to you. In the event that you lose your iPhone/iPad in an area where it is not discovered, “Find my iPhone” will receive and store a last gasp “this is where I am” location when the battery charge drops below a certain threshold. Hence it’s last known position will be available to you long after the charge goes in the battery – which should make it much easier to locate. Another feature is that some applications can appear in one corner of the lock screen when you are in proximity to specific locations (eg: Starbucks outlet, ticket office, airline check-in). Hence a useful application to complete a transaction is always automatically available to you. For environments like my son’s family, there will be an ability to daisy chain up to 6 Apple IDs (and their associated iDevices) as a single entity. Parents can assign Parental controls to their kids devices, and if the kids try to order anything from iTunes (or in-app purchases), approval will be sought from one of their parents – who on acceptance, will be charged against their own credit card. Joining the families devices in this way also gives a shared photo library, shared access to media (where desired), and allows parents to see the location of all devices using “Find my iPhone”. The ability to set Parental Controls will no doubt help my son, who once walked in on his 10 year old Aspergers/ADHD son’s bedroom to be greeted by Siri saying “I don’t understand what you mean by Who is Postman Pat’s Boyfriend”. Apple have put in some of the functionality of competitive messaging platforms, so you can send voice messages and video to other users over iMessage inline with your normal text stream. You can also elect to reverse yourself out of group conversations at any time. That said, the more impressive thing is that if you receive a message on your iPhone, you can raise the handset to your ear, say something like “Hiya – in a meeting, will be back to you in 25 minutes max” and take the phone away from your head. The act of doing so sends that audio message back to the person who’d messaged you immediately. When the iPhone is plugged into a power source or car adaptor, Siri is available from the lock screen by saying “Hey, Siri” – just like my Nexus 5 responds (at any time) to “OK, Google”. Good to send text messages vocally and to instruct navigation in a hands-free manner. Don’t believe what you read in the newspapers. Apple announced an in-iPhone database and display program called “Health” (what was known as Healthbook in pre-release rumours). This is designed to act as an interface to countless 3rd party devices like step counters (FitBit), heart monitors, blood sugar sensors etc – and to place all that data into a consolidated database and presentation application running on the users iPhone handset. That said, the resulting data is heavily protected; just like Android, you have to specifically authorise access to sections of that data to any application that wants to gain access to it. Hence the one application cited – from the Mayo Clinic – would download data into their systems, or to be alerted when readings deviate from specific thresholds for emergency attention. That said, the end user has to specifically authorise what part of the data in the Health database could be exposed to the Mayo application; no permission, there is no access. This is something the mainstream press completely miss; you have full control over your data, and nothing travels to your GP or Hospital without your explicit (and revocable at any time) permission. Apple also announced an application programming interface that permits access to home control equipment, like electronic locks, lights, heating, fire alarms and so forth. While they have signed up many of the existing home automation vendors to give a uniform interface for the iPhone or iPad, there is currently no associated user interface at the time of writing. Instead, the user can instruct Siri (the voice control on an iPhone/iPad) to perform one or more steps (aka “Scenes”) to issue commands, such as “Lock the front door” or “Going to Bed” (to lock the house, garage and alter lighting levels around the house). Still early days. Really for folks with wall to wall Apple devices from Macs down to iPhones. The devices can sense when they are in close proximity to each other, and can hand off work and communications traffic between them for applications developed using Apple’s Continuity API. So, you can get your Mac to place a phone call from a number on the Mac screen via a close by iPhone, or to see messages received on your iPhone in your Mac notifications – and even move in-progress work live between devices. Where your Cell provider allows it, you can even use your iPhone to place calls over WiFi (in effect turning your Mac into a Femto cell) if cell coverage around you is otherwise poor. Most of the rest of the announcements were aimed at developers. Despite what Tim Cook said about Android, almost all the enhancements (outside of programming language Swift and the Gaming APIs (SpriteKit, Metal) allow deep embedding of third party applications into iOS for the first time; this is something Android has done for years. There are thousands of changes everywhere, with tidy ups of the User Interface on both Mac OS/X and on iOS (which now look surprisingly similar) and neat tricks everywhere. There is also functionality under the hood to enable iOS to (at last) handle different dot dimension screens. 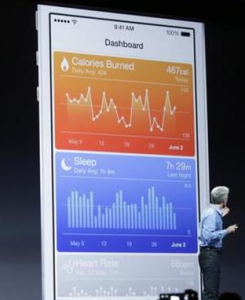 I’m watching a few of the WWDC videos (in the iOS WWDC App), in particular those related to HealthKit and the Health App, so see how they integrate with back end systems (a professional interest!). So, all ready for developers to get themselves ready for the next slew of Apple hardware announcements in the Autumn. Looking forward to it!